Okay. Glad we looked at that first. I would have tried to assemble part 2 before part 1 had I not checked that first. Boy, would my face have been red. 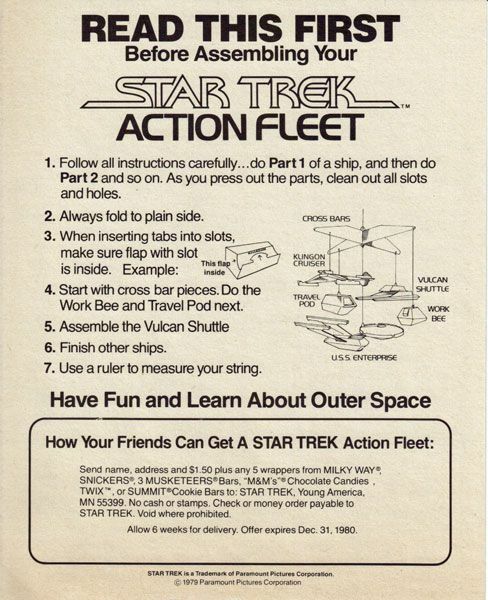 Oh... and apparently this item allows one to "Have Fun And Learn About Outer Space". The fun part I get... but I'm still scratching my head as to what I learned about outer space. Other than the fact that there are giant starships flying around up there. Aside from those instructions, this sheet also details how one would have received this piece of perforated paper perfection. If you had 5 candy bars and $1.50 lying around, you were in business. 5 candy bars!?! Remember- that was back in 1979... No wonder our kids are in such rough shape nowadays. Oh, and what the heck is a "Summit" candy bar? Sounds pretty freaking boring. I guess "Board Meeting", "Business Retreat", and "Company Outing" were alternative candy bar names that just didn't make the cut. 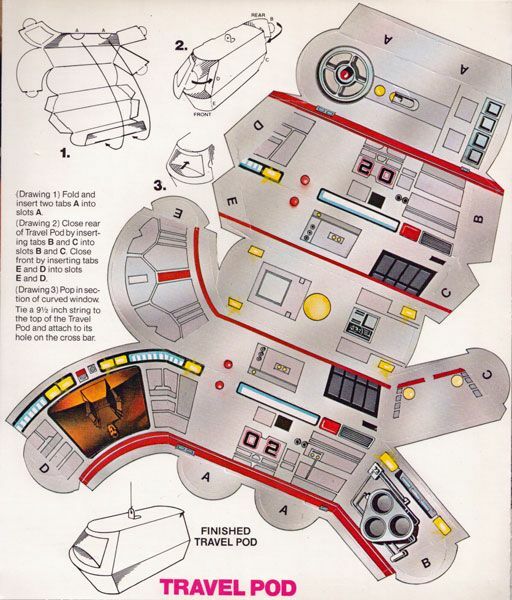 Since it's all contained in one piece, the Travel Pod is the easiest of the bunch to assemble. 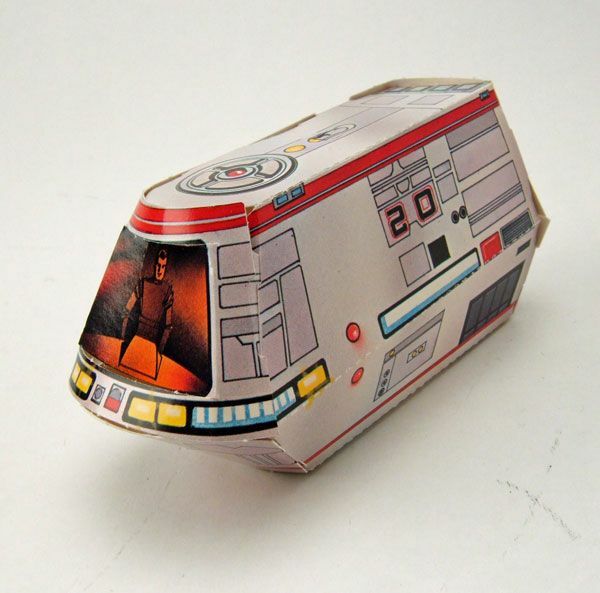 I wish the image of the cockpit area featured Scotty and Kirk instead of a single pilot, but the ship itself is neatly done and is a fair approximation of the screen-used miniature (especially when you consider this is just folded up paper). This one was a breeze to assemble, with only 2 parts in all. It may seem an odd choice for the mobile, since it has so little screen time, but I can't fault Mars for including something extra. 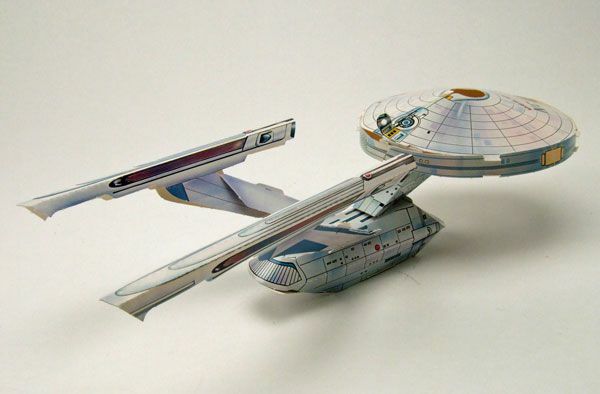 It's grossly out of scale with the Enterprise, but it looks nifty so I am cool with it. Now we're getting down to business! 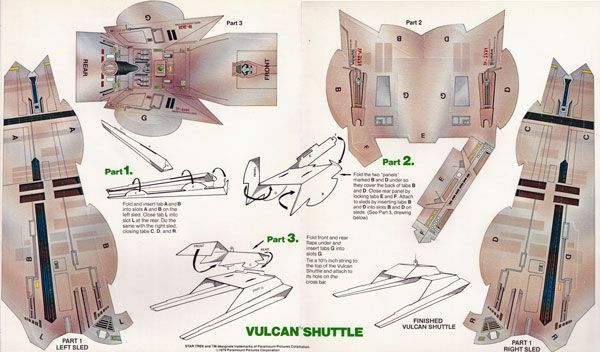 As cool as the 2 smaller vehicles turned out, I was really impressed by how the mobile's designers managed to pull off the Vulcan shuttle. 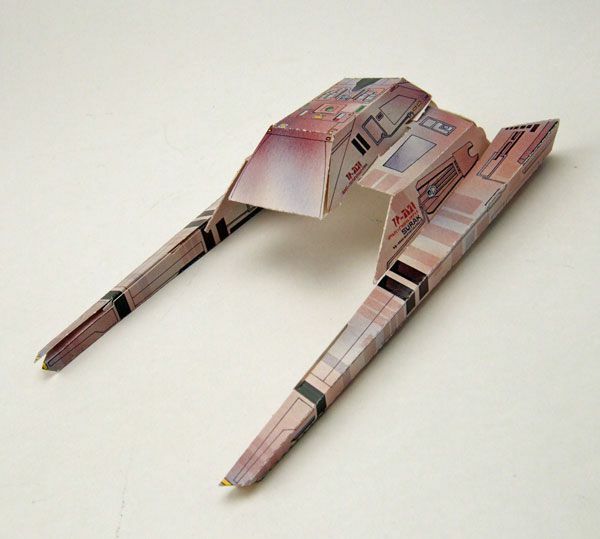 Though it seems like a relatively simple ship design, reproducing it as a paper good was probably a fairly daunting task. The end result is very nice, with this ship being my favorite of the bunch. While I understand the limitations of what I'm working with, I was a bit disappointed in this one. I guess it's almost impossible to capture the spherical look of the bridge area as a paper construct. 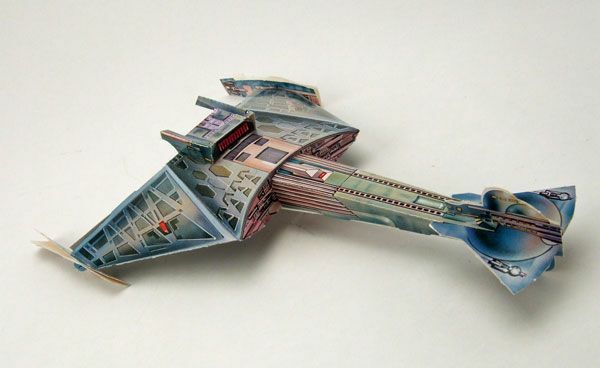 But after the awesomeness of the Vulcan Shuttle, the Klingon Cruiser was a slight letdown. By the time I finished this one, I felt like an origami Jedi. Like I could make a scaled model of the Taj Mahal using 2 Kleenex and a sheet of construction paper. It's the little victories in life that are worth celebrating. Even with a couple of minor nitpicks, I think they did a fantastic job on this one. 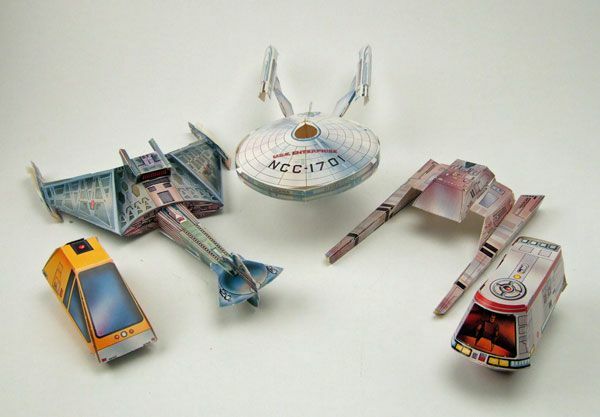 sure, there's a hole through the saucer section and the ship is a bit wobbly, but MAN... that's the Enterprise... MADE OUT OF PAPER! Awesome sauce. Sadly, though my hands were sweaty and my fingers numb, I wasn't quite finished. The last bit of work was the crossbar section you see above. This one is easily slapped together though, so I managed to push on through. 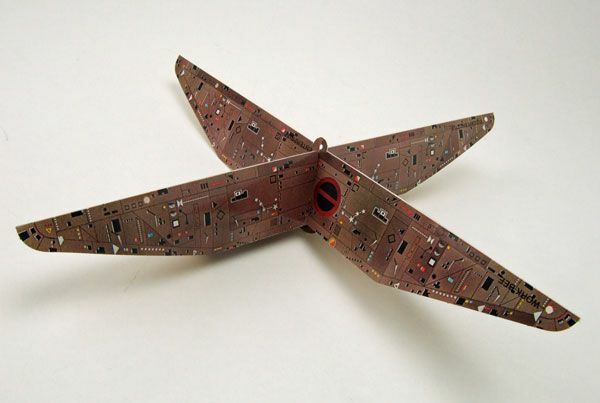 Included with the pack is a length of string that you thread through the assembly and into your completed ships, allowing them to dangle in orbit. I guess that's the part where you learn about space. You'll notice I don't have an a picture of the assembled mobile. Well, that's because I didn't want to try and get the thing home like that... though in hindsight, dangling the whole rig from my rear-view mirror would have ruled. 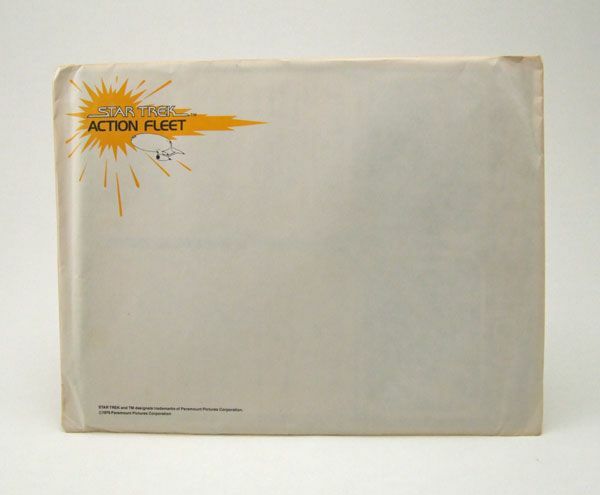 I wish I had bought this back then, but considering I was living at home with the Anti-Trek brigade, I knew I couldn't display it, so I passed. Such lack of foressight! I do think that 5 candy bars might be needed to supply the energy to put these all together at one time, though. "I felt like an origami Jedi." LOL. I never had this as a kid when ST-TMP came out, but after reading your post, I wish I did. 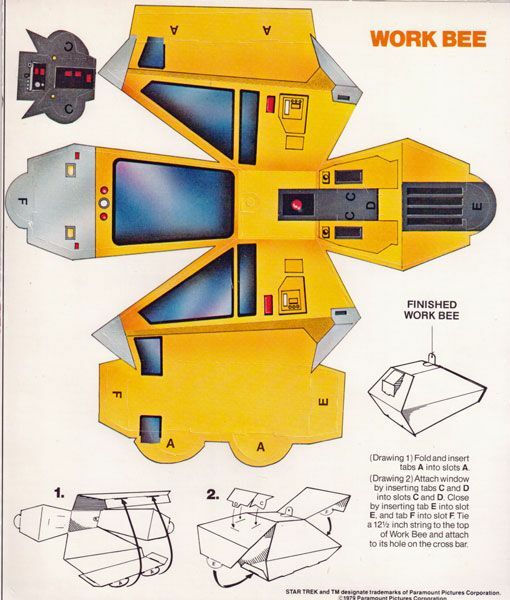 I have always loved the Travel Pod and Workbee model designs and the paper versions you made here are pretty nifty. Another bonus is the cool photos not only of each ship, but of the crew as well. ST-TMP often gets a bad rap, but I absolutely love the photography and designs of this film - IMHO it is the most epic of the ST movies. Great post - you obviously had a blast and the result was so cool. Gorgeous photos as well. James... Seriously... you read the instrucions... you constructed the cross bars last... the instrucions specifically tell you to construct them FIRST... I demand that you do it all over again... and this time correctly! lol. 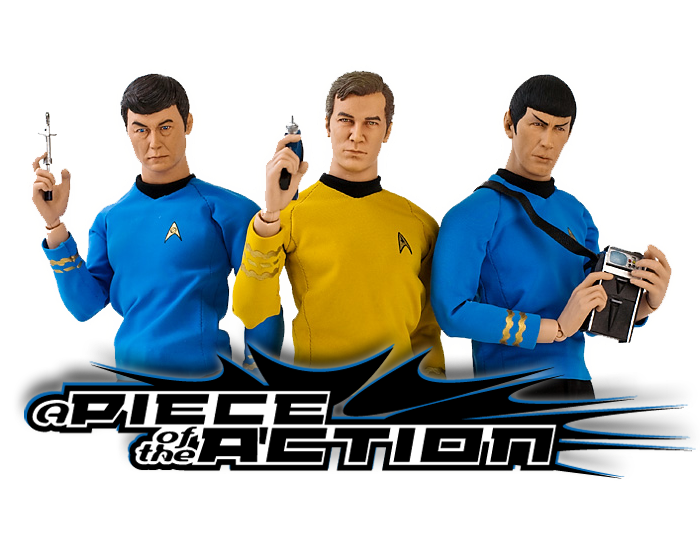 Awesome Trekness! OMG! I had forgotten about this! I had this, and looking at your pictures, I remember building it... I wonder what happened to it. Thanks for the post! 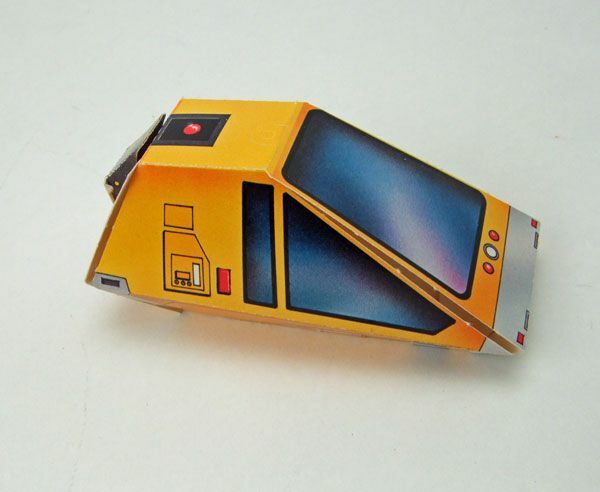 One thing I was surprised that you didn't comment on is the fact that the Travel Pod model is based on a flopped image of the filming miniature. This makes the "05" designation come out as more of funky "20". This was a common issue I remember with a lot of the early promotional images from "The Motion Picture"; whether deliberately, or accidentally, a lot of promotional photos got printed backward. 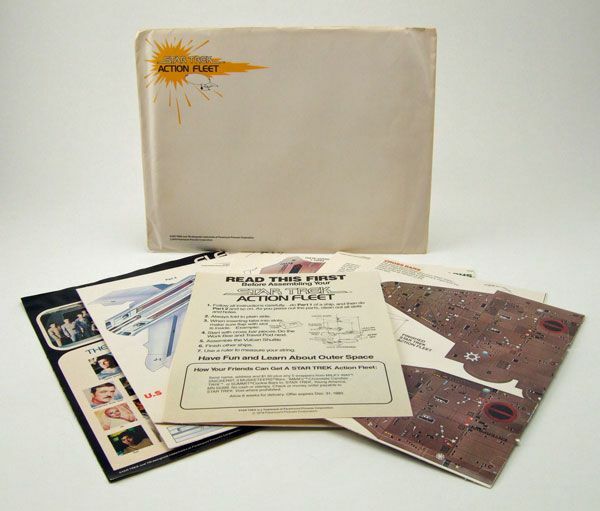 There were a series of 'trading cards' printed on the back of cereal boxes ( Post brand, I believe? ). And if I am recalling correctly, most, if not all of them were flopped. If it was accidental, you would think that at least ONE sharp-eyed editor, or printer would have noticed the Starfleet arrowhead insignia on the right hand side of the actors uniforms, and corrected them. I always did wonder if Paramount insisted on the pictures being printed flopped at the time. 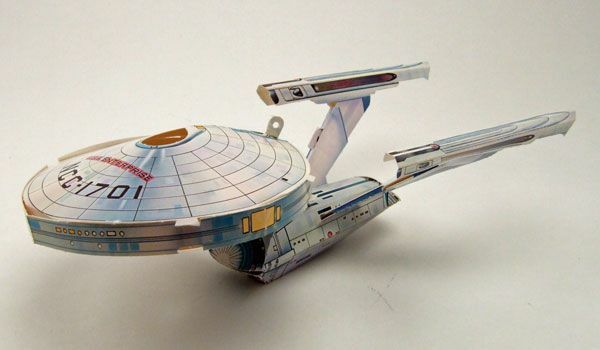 First, you did a GREAT job on building those things; I especially remember my Enterprise looking pretty 'battle damaged' when I tried putting it all together back in the day. Second--I have close to a dozen of these things, mint in their original envelopes. I have no memory of how I collected--what--60 candy wrappers? But I did (probably raided trash cans at Temple U. ), sent them a check and instead of sdending them one at a time, they put all twelve into a giant reinforced envelope and sent them UPS (it still has the postmark--July 1980!). I have NO idea what these things are worth or even if its Kosher to offer them here, but if anyone is interested and it is't a violation of Federation policy, they can contact me.